This is a strange series which appears to start at number 2. The reality is that the first realistic analysis was made by the Chief of the Defence Staff Air Chief Marshal Sir Jock Stirrup in his 2008 speech on Iraq and Afghanistan which we published in full on 1st December 2008. Today he published immediate reaction to the deaths of 8 UK soldiers in 24 hour, which we reproduce below. The sting is in the tail, and from which we draw the sub heading for this piece. In an immediate reaction to UK casualties in Afghanistan (8 dead in 24 hours, no news on wounded, as usual with MoD announcements) British Foreign Secretary David Miliband spoke to the BBC Radio 4 "Today" programme about the situation in Afghanistan on 11 July 2009. John Humphrys (JH): Eight British Servicemen have been killed in Afghanistan in twenty four hours. That fact, hideous though it may be, does nothing to change the intellectual argument for the British presence there. But emotionally and politically it may well change everything. Cartoon in The Observer 19th July : Taliban fighter says "The sooner you give up on this war and go home, the sooner we can get back to beheading infidels, stoning women, persecuting school girls, producing heroin and exporting jihad in peace." It's easier to repeat an old lie than reveal a new truth. Politicians are in denial and refuse to confront the deep futility of the war in Afghanistan. It's more comfortable to tilt at the windmills of peripheral issues. Last year it was blaming fellow Europeans for dodging their share of the burden. Now, it's the myth that more troops and helicopters are solutions. US Vice-President Joe Biden has told the BBC today that the war in Afghanistan is in the interests of the US and the UK. "It is worth the effort we are making," he said, warning that the terror groups on the border with Pakistan could "wreak havoc" on Europe and the US. The number of foreign troop deaths has jumped recently, sparking questions in the UK over its involvement in the war. 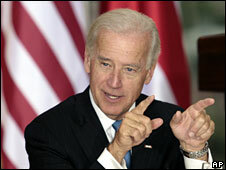 Mr Biden suggested more sacrifice would have to be made during what he termed the "fighting season". He was speaking to the BBC's Jonathan Beale during a European trip which has taken him to Ukraine and Georgia. The vice-president insisted that "in terms of national interest of Great Britain, the US and Europe, [the war in Afghanistan] is worth the effort we are making and the sacrifice that is being felt". He added: "And more will come". He said forces were for the first time directly tackling Taleban fighters in some areas of the country (see map below) "This, unfortunately, is the fighting season [...] the trees are up in the mountains again, people are able to infiltrate from the hills of Pakistan, and in Helmand province - where the Taleban had free rein for a number of years, we are engaging them now." And he reiterated the Obama administration's rationale for the conflict. "This is the place from which the attacks of 9/11 and all those attacks in Europe that came from al-Qaeda have flowed from that place - between Afghanistan and Pakistan." He said the terror groups who sheltered along the Afghan-Pakistan border combined with the country's role in the international drug trade - supplying 90% of the world's heroin - meant the war in Afghanistan needed to succeed. "It is a place that, if it doesn't get straightened out, will continue to wreak havoc on Europe and the United States," he said. He said the goal of the US was both "eradicating terrorism and not planting the seeds for its return," underlining the importance of removing the lucrative heroin-producing poppy crop which funds both al-Qaeda and radical jihadists. Over the last few years, the US has used controversial drone attacks to hit militant targets in Pakistan from Afghanistan. Pakistan has in the past expressed concerns about the impact of such military offensives in southern Afghanistan on south-west Pakistan as militants seep over the border into the restive Baluchistan province. Mr Biden was full of praise for British troops, calling them "among the best trained and bravest warriors in the world". But he was unable to comment on the standard of equipment that British troops had been given. A political row has broken out in the UK over the adequacy of British troops' equipment, after Foreign Office Minister Lord Malloch Brown told a reporter that "we definitely don't have enough helicopters". Lord Malloch Brown later withdrew his remarks. Critics say British troops' lack of helicopters has made them more vulnerable to roadside explosives. Mr Biden said that he was "not in a position to make a judgement" but said he assumed they had all they needed. Asked about the recent announcement that a report on the closure of the Guantanamo Bay prison camp was being delayed, Mr Biden said the administration had been busy trying to determine what should happen to each of the detainees held there. "We are going through every single detainee's records ... to make a judgement about whether or not they should be tried [or] ... released and if so what country might take them if we can't get them back to the country of origin because they're going to be tortured or mistreated," he said. But he expressed confidence that the camp would still be closed according to the timetable laid out by President Barack Obama in January, and hinted that some of the detainees would be retained at another prison. "We expect before January - well before January - we will have a decision on each and every individual being held." Task Force Helmand is one half of the ISAF force in this province, comprising some six thousand troops from the United Kingdom, Denmark and Estonia. As many of you know, three weeks ago my Task Force launched Operation PANCHAI PALANG, and even as I speak to you today, we are continuing our deliberate advance to clear anti-Afghan forces from key towns and villages in central Helmand. The following quotations from Hansard show what the former Secretary of State for Defence John Reid promised, pledged, expected or hoped about the arrival of UK troops in Helmand province/ Afghanistan and in particular that the mission would be completed easily, speedily or entirely peacefully. Ballistic missiles equipped with nuclear warheads and other mechanisms of mass destruction are the most potent weapons that America's defenders face. The number of ballistic missiles in global arsenals has declined considerably since the end of the Cold War, but the number of nations possessing such weapons has increased. At least nine countries today have both ballistic missiles and nuclear warheads, raising doubts about whether the traditional approach to deterrence can work over the long run.